N 44° 50' 25" and W -0° 34' 49"
Bordeaux in Gironde (Nouvelle-Aquitaine) with it's 231,844 citizens is a city in France about 310 mi (or 499 km) south-west of Paris, the country's capital city. Local time in Bordeaux is now 11:20 PM (Monday). The local timezone is named Europe / Paris with an UTC offset of 2 hours. We know of 10 airports in the vicinity of Bordeaux, of which 3 are larger airports. The closest airport in France is Bordeaux-Mérignac (BA 106) Airport in a distance of 7 mi (or 11 km), West. Besides the airports, there are other travel options available (check left side). There are several Unesco world heritage sites nearby. 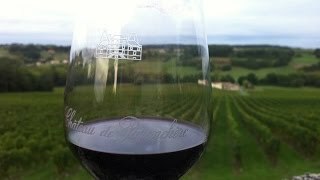 The closest heritage site in France is Jurisdiction of Saint-Emilion in a distance of 36 mi (or 58 km), East. Looking for a place to stay? we compiled a list of available hotels close to the map centre further down the page. When in this area, you might want to pay a visit to some of the following locations: Blaye, Libourne, Langon, Lesparre-Medoc and Arcachon. To further explore this place, just scroll down and browse the available info. Let's start with some photos from the area. 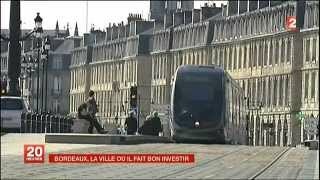 La ville la plus attrayante c'est Bordeaux ! Reportage du JT France 2 du 08 mai 2012 à 20h00 © 2012 France Télévisions // © France 2. 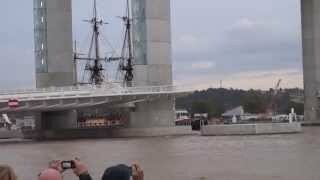 Passage de L'Hermione sous le pont Chaban Delmas. L'Hermione est la réplique de la frégate ayant embarqué La Fayette parti en Amérique en 1780 combattre les insurgés. 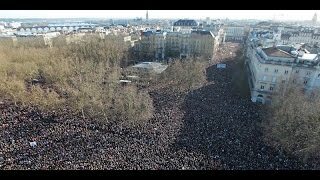 Marche républicaine : + de 140 000 personnes à Bordeaux le Dimanche 11 Janvier 2015. Je Suis Charlie. Louis Davion nous présente sa discipline sur les spots de la Bastide. Located at 44.838, -0.578 (Lat. / Lng. ), about 0 miles away. The Basilica of St. Michael, Bordeaux, is a Flamboyant Gothic church in Bordeaux, France, built between the end of 14th century and the 16th century. The pulpit represents Saint Michael slaying the dragon. The stained-glass windows were destroyed during the bombardment of 1940. The separate bell tower, which is 114 meters tall, was built in the 15th century. In 1881 a Gallo-Roman cemetery and catacombs were discovered under the tower. The church is a listed historical monument. Located at 44.8344, -0.5649 (Lat. / Lng. ), about 1 miles away. Grand Théâtre de Bordeaux, is a Theatre in Bordeaux, France, first inaugurated on 17 April 1780. 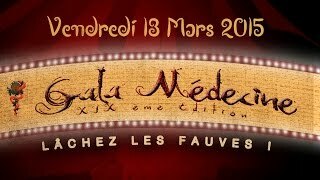 It was in this theatre that the ballet La Fille Mal Gardée premiered in 1789, and where a young Marius Petipa staged some of his first ballets. The Theatre was designed by the architect Victor Louis (1731-1800), who was selected for the task by winning the famous Grand Prix de Rome. Located at 44.8425, -0.573611 (Lat. / Lng. ), about 0 miles away. Located at 44.8378, -0.579722 (Lat. / Lng. ), about 0 miles away. Bordeaux Cathedral (Cathédrale Saint-André de Bordeaux) is a Roman Catholic cathedral, seat of the Archbishop of Bordeaux-Bazas, located in Bordeaux. The cathedral was consecrated by Pope Urban II in 1096. Of the original Romanesque edifice, only a wall in the nave remains. The Royal Gate is from the early 13th century, while the rest of the construction is mostly from the 14th-15th centuries. The building is a national monument of France. Located at 44.8378, -0.5775 (Lat. / Lng. ), about 0 miles away. The Institute of the Good Shepherd (French: Institut du Bon Pasteur) is a Catholic society of apostolic life of traditionalist Catholic priests in full communion with the Holy See. Located at 44.8356, -0.570833 (Lat. / Lng. ), about 1 miles away. The Place des Quinconces, located in Bordeaux, France, is one of the largest city squares in Europe (approximately 31 acres or 126,000 m²). It was laid out in 1820 on the site of Château Trompette, intended to prevent rebellion against the city. The guns were turned towards the center. Its current shape (lengthened rectangle rounded off with a semicircle) was adopted in 1816. The trees were planted (in quincunxes, hence the name of the square) in 1818. Located at 44.8456, -0.573611 (Lat. / Lng. ), about 0 miles away. 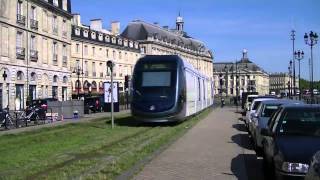 The station Hôtel de Ville is situated on lines and of the tramway de Bordeaux. The station serves as a junction for the two lines. Located at 44.8377, -0.576317 (Lat. / Lng. ), about 0 miles away. Bergonié station is located on line of the tramway de Bordeaux. Located at 44.825, -0.578231 (Lat. / Lng. ), about 1 miles away. Saint-Nicolas station is located on line of the tramway de Bordeaux. Located at 44.829, -0.573992 (Lat. / Lng. ), about 1 miles away. Quinconces station is located on line and line in Bordeaux. This stations serves as a connection to line . 19 November 2007, line C has been extended to Quinconces by way of Grand Parc. Located at 44.8443, -0.57395 (Lat. / Lng. ), about 0 miles away. This article is about the street in Bordeaux. For other streets of this name, see Rue Sainte-Catherine (disambiguation). The rue Sainte-Catherine, a 1.2 km long pedestrian street, is the main shopping street in Bordeaux, France. This street is one of two main lines running through the historic part of the city. It cuts the center following a North-South axis linking the place de la Comédie where the Grand Theatre at the Place de la Victoire. Located at 44.8398, -0.574183 (Lat. / Lng. ), about 0 miles away. Grand Théâtre station is located on line of the tramway de Bordeaux. Located at 44.842, -0.575258 (Lat. / Lng. ), about 0 miles away. Gambetta station is located on line of the tramway de Bordeaux. Located at 44.8406, -0.578328 (Lat. / Lng. ), about 0 miles away. Musée d'Aquitaine station is located on line of the tramway de Bordeaux. Located at 44.8354, -0.575244 (Lat. / Lng. ), about 0 miles away. Victoire station is located on line of the tramway de Bordeaux. Located at 44.8312, -0.573047 (Lat. / Lng. ), about 1 miles away. CAPC station came into service 23 July 2007 on line of the tramway de Bordeaux. Located at 44.8491, -0.570458 (Lat. / Lng. ), about 1 miles away. Place de la Bourse station is located on line of the tramway de Bordeaux. Located at 44.8416, -0.569658 (Lat. / Lng. ), about 1 miles away. The Pont de pierre, or "Stone Bridge" in English, is a bridge in Bordeaux,, which connects the left bank of the Garonne River (cours Victor Hugo) to the right bank quartier de la Bastide (Avenue Thiers). Located at 44.8385, -0.56305 (Lat. / Lng. ), about 1 miles away. Tour Pey-Berland, named for its patron Pey Berland, is located in Bordeaux at the Place Pey-Berland next to Cathédrale Saint-André. Located at 44.8376, -0.576556 (Lat. / Lng. ), about 0 miles away. Porte de Bourgogne station is located on line and line of the tramway de Bordeaux. This stations serves as a junction between two lines. It also allows the passage from one line to another through a switch between the two lines. Located at 44.8372, -0.566306 (Lat. / Lng. ), about 1 miles away. The Jardin botanique de Bordeaux (0.5 hectares) is a municipal botanical garden located at Place Bardineau, Bordeaux, Gironde, Aquitaine, France; it is open daily without charge. This historic garden has been recently supplemented by the Jardin botanique de la Bastide, located across the river. Although the garden's origins extend back to 1629 AD, with the creation of Bordeaux's first medicinal garden, today's botanical garden dates to 1858. Located at 44.8495, -0.5801 (Lat. / Lng. ), about 1 miles away. The French National School for the Judiciary is a French post-graduate school, where French judges and public prosecutors are trained. The institution was created in 1959 as the "National Centre for Judicial Studies" . 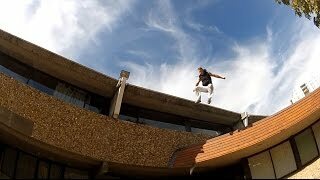 It became the French National School for the Judiciary in 1972. It is located in Bordeaux and has premises in Paris. Located at 44.8367, -0.579138 (Lat. / Lng. ), about 0 miles away. The Musée des Beaux-Arts de Bordeaux is the fine arts museum of the city of Bordeaux, France. Established in 1801 it is one of the largest art galleries of France outside Paris. The museum is housed in a dependency of the Palais Rohan in central Bordeaux. Its collections regroup paintings, sculptures and drawings. The painting collection is the largest one and its strong points are works by French and Dutch painters. Located at 44.8374, -0.581 (Lat. / Lng. ), about 0 miles away. Château du Hâ is a château in Gironde, Aquitane, France. Located at 44.8364, -0.579444 (Lat. / Lng. ), about 0 miles away. 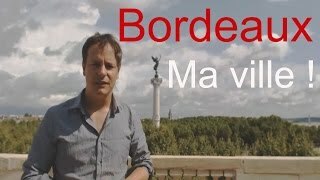 These are some bigger and more relevant cities in the wider vivinity of Bordeaux.